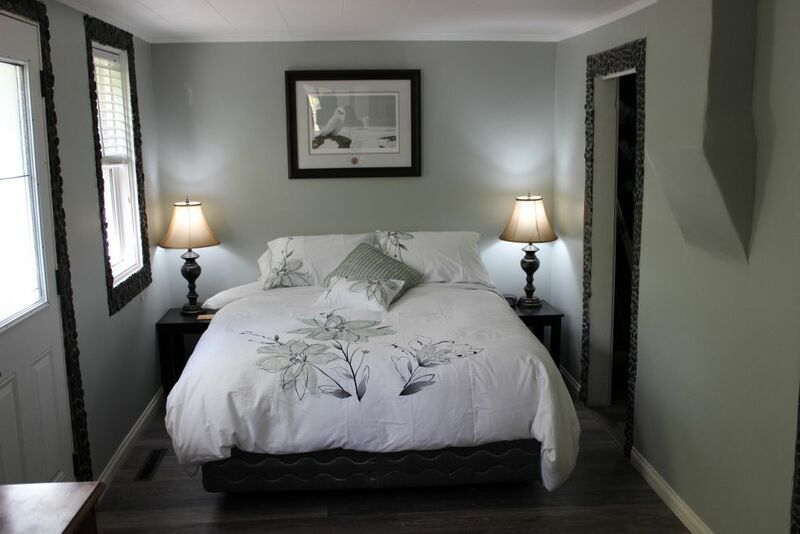 One bedroom holiday home located on the Crowsnest River. The River Shack vacation home offers a peaceful, quiet and tranquil atmosphere. Centrally located at the end of a quiet street on the Crowsnest River; yet within a comfortable walking distance to all amenities. - Freshly renovated; completely furnished, full equipped and self-contained home. It includes all bed linens, towels, cable tv, intenet/wifi, laundry facilities, 4 piece bath, fully equipped kitchen with microwave, full sized stove/oven, toaster oven, coffee maker, cutlery, pots and pans etc... You will enjoy the private backyard with deck, BBQ and fire pit. - Great location for all kinds of fishing, quadding, snowmobiling, skiing, hiking, or just relaxing. WHEREVER YOU CHOOSE TO STAY, WE KNOW YOU WILL HAVE A GREAT TIME IN THE BEAUTIFUL CROWSNEST PASS!! Just a short walk to downtown Blairmore where you will find unique shopping, restaurants and groceries. Enjoy gorgeous mountain views from your living room window. Located on the beautiful Crownest River. Step out the back door and make your first cast of the day. Fully equipped kitchen with stove, fridge, microwave, toaster oven, Kurig coffee maker, toaster, pots, pans, dishes, cutlery, spices, coffee and tea. We loved staying at the River Shack. It was roomy enough, well equipped, and within distance from nice ski hills. We ended going to Castle Mountain most days; about 40 minutes drive, which gave us all the benefits of being nearby without the "busy" of staying on the hill itself. Would love to return next winter! We absolutely loved the few days we were able to stay at the River Shack! The home is so cute, cozy and comfortable! The minute we opened the door we felt right at home! We were pleased with the cleanliness as well as eye catching decor! We couldn’t have asked for more! The backyard is well-kept and inviting. Sitting by the river reading was so relaxing. The only drawback was the sound of the traffic on the highway behind which wasn’t that much of a problem once we got used to it. Thankfully you could not really hear the traffic inside. We are definitely looking forward to returning again for a nice little get away! Thanks for everything Bob and Joyce! Really enjoyed staying here. It has all the conveniences. kitchen/dining area is a good size. All the appliances including a dish washer look very new and worked perfectly. The washer and dryer are large and although I did not use them they would hold a good load. The BBQ out back worked perfectly and also looked new. Excellent shower with good water pressure and almost instant hot water. Although its close to the highway there is very little road noise inside the house. Would definitely stay here again. Thank you so much for your review. We hope you will return for another fishing trip one day. It was a pleasure meeting you and to have you stay at The River Shack. Until next time... keep your flies tied and your line afloat!! Clean and comfortable with many special touches! We had such a relaxing time in Crowsnest Pass. There were so many interesting and fun things to do in the area and nice not to have it overrun with tourists. The River Shack was a perfect little spot to hang out in when we weren't out exploring. It was very clean and cozy. Joyce and Bob had thought of so many details to make it feel like "home". The bed was comfortable and the kitchen was very well stocked. There was nothing we needed that wasn't there. We enjoyed the pictures of nature and animals that they had thru out the house. We couldn't of asked for a nicer place to stay during out time in Crowsnest Pass. Thank you for sharing your home with us, Joyce and Bob! Thank you so much for all of the positive feedback; your compliments mean a lot to us. Thank YOU for treating the River Shack like your home away from home. We really appreciate you taking such great care. The river shack is very well stocked and has everything you could possibly need. The location is right on the river and is very pet friendly. We enjoyed our stay and the beautiful scenery in Crowsnest pass was incredible! Found everything we needed and more. Beautiful spot!